In the world of high-tech these days, Google is all but impossible to ignore. Whether it is the fun, such as the beginning-of-the-month April Fools’ joke over renaming itself Topeka; the flaps, such as the recent censorship issues in China; or even the flops, like the peak of interest in the firm’s new social media solution, “Google Buzz,” followed by seeming public indifference just weeks later, Google seems to be forever in the news. 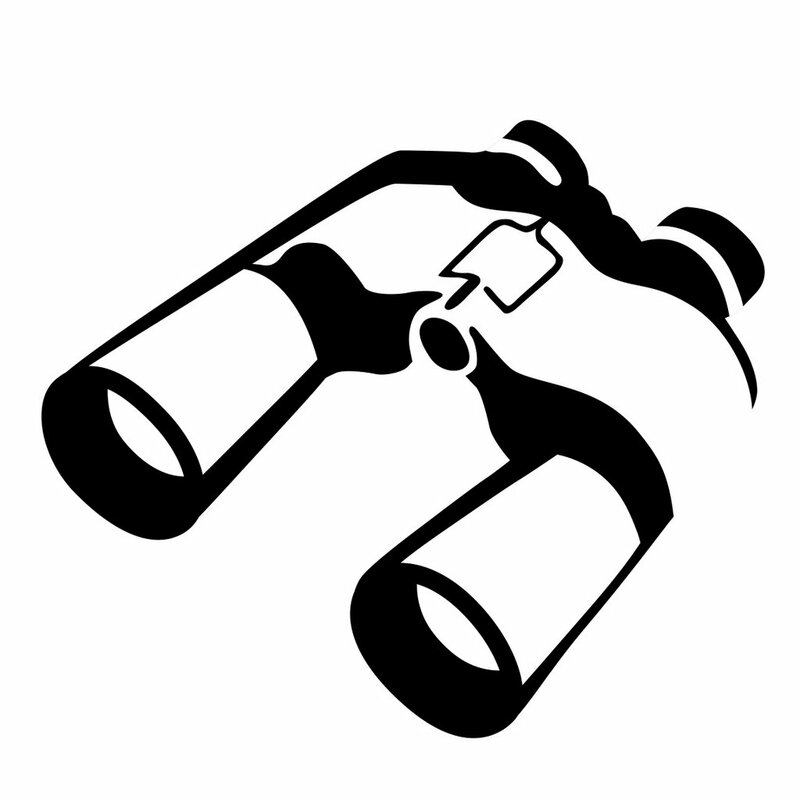 Nonetheless, the company still occasionally manages stealth activities that offer true innovation. One example that seems relevant to the printing industry is Google’s Fast Flip program, which is now featured as part of the regular Google News Web page. 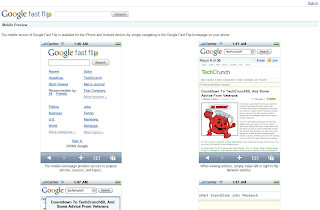 Starting last fall, I became aware of the Google Fast Flip standalone site, as it appeared in some of my searches. 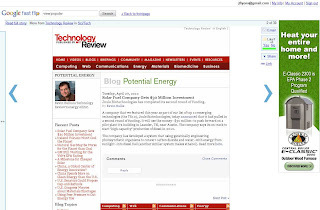 I was particularly interested in the presentation of newspaper and magazine pages, grouped by subject matter or source, as that topic was parallel in many ways to the PC Magazine online conversion that I covered at the end of 2008 (click here; http://jimlyonsobservations.blogspot.com/2009/06/observations-from-magazine-rack.html). A little research proved that Fast Flip was one of many Google labs projects that may or may not become established in any meaningful way. 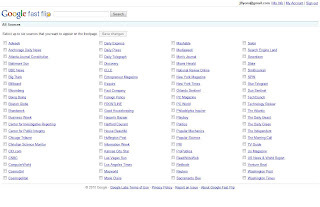 As the official Google blog explained in September 2009, Google worked with three dozen publishers to put their content online in the form of an intuitive, easy to access newspaper/magazine style, complete with the ability to quickly flip through pages as the name suggests. Google proceeded along, promptly but quietly, and by December, announced that it had signed up 50 additional “newspapers, magazines, Web outlets, newswires, and TV and radio broadcasters,” bringing the firm’s total number of sources to nearly 90. 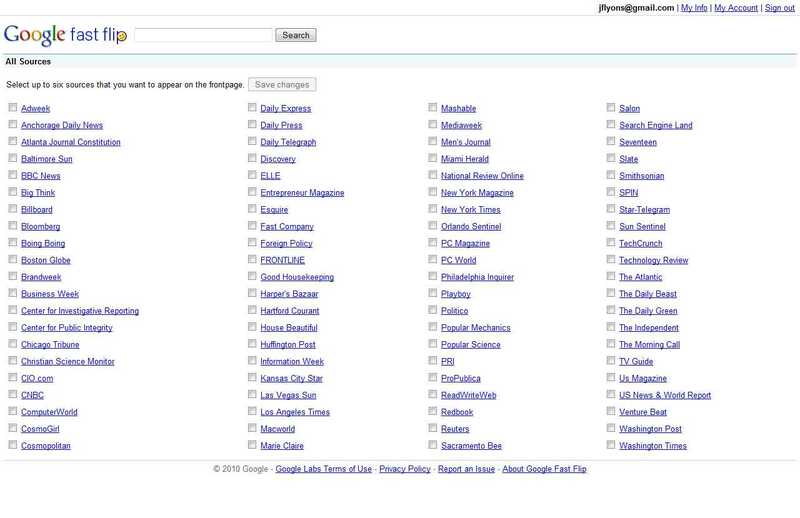 Early in 2010, Google quietly inserted Fast Flip into the bottom of the Google News page. One more point about this Google effort? These are cooperative relationships. 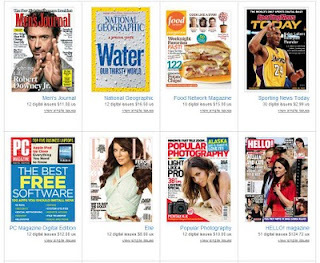 Recently, much press has been given to the inevitable conflict between Google and traditional publishers, but in the case of Fast Flip, anyway, there is a cooperative agreement for revenue sharing from advertising. As shown in some of the images below, Google combines search with the printed publication metaphor to present familiar looking magazine-type pages that viewers can scroll through, to the left or right. 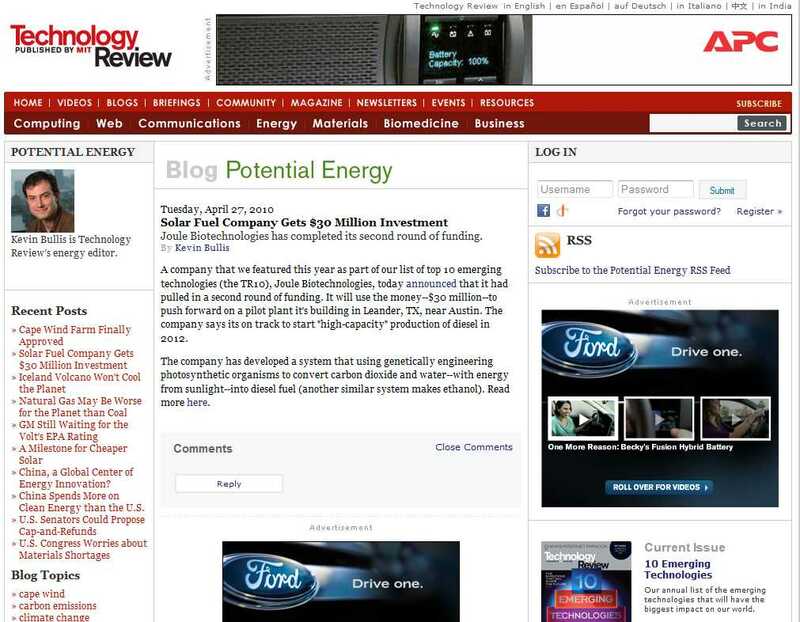 Another quick mouse click pulls up a full page version of the page of interest, but this is really just an enlarged thumbnail, with another click getting full browser access to the original page. And what about printing? While Google did not respond directly to questions about printing from Fast Flip, apparently the only way (for now) to print a page is to scroll to the page of interest, click through to the “real” page, and then print via traditional browser printing. 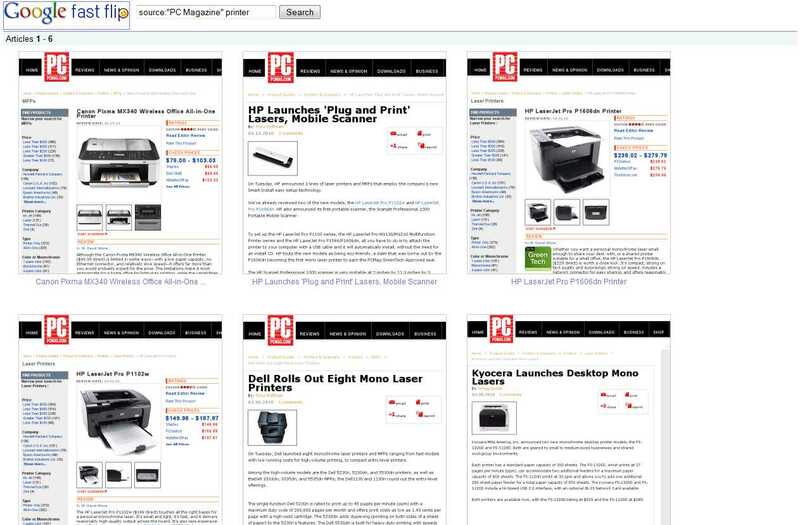 As some readers may remember when we chronicled the conversion of PC Magazine from hard copy to online, the participating online publishing company, Zinio (www.zinio.com), actually enhanced the online version to allow easier printing, including collections of pages (click here; http://jimlyonsobservations.blogspot.com/2009/02/thanks-for-listening-pc-magazine.html). 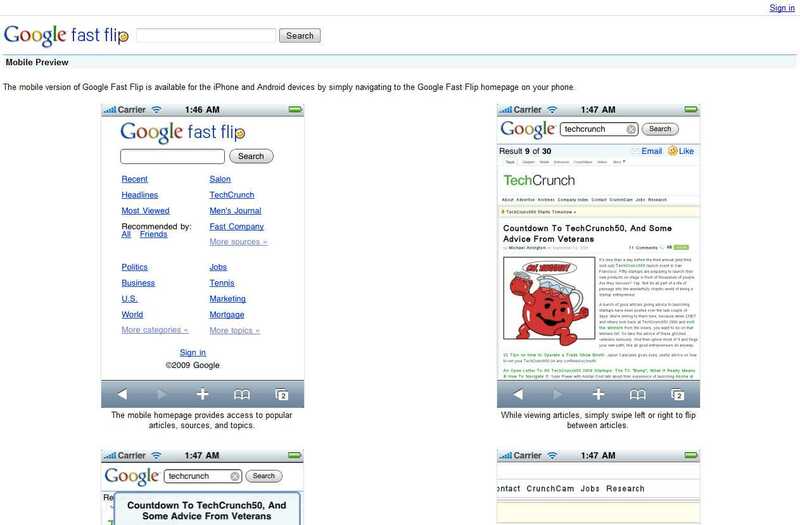 Perhaps Google Labs will get the message, too, and offer enhanced printing from Fast Flip directly. Speaking of PC Magazine, one of Google’s 90 sources is that venerable publication, and by presenting the source in a continuous fashion, rather than issue by issue, I found I could gather more relevant collections, like everything PC Magazine has published on printers over several months (see below). 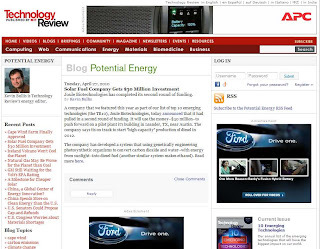 And speaking of news and PC Magazine, a recent piece by Michael Miller, the same industry guru I quoted last year about the history of PC Magazine's printer coverage over the years (click here; http://jimlyonsobservations.blogspot.com/2009/02/observations-new-online-pc-magazine.html), titled, “Can the iPad Save Magazines?”; (http://blogs.pcmag.com/miller/2010/04/can_the_ipad_save_magazines.php) covers a new Zinio iPad application that gives users access to Zinio’s large stable of publications. 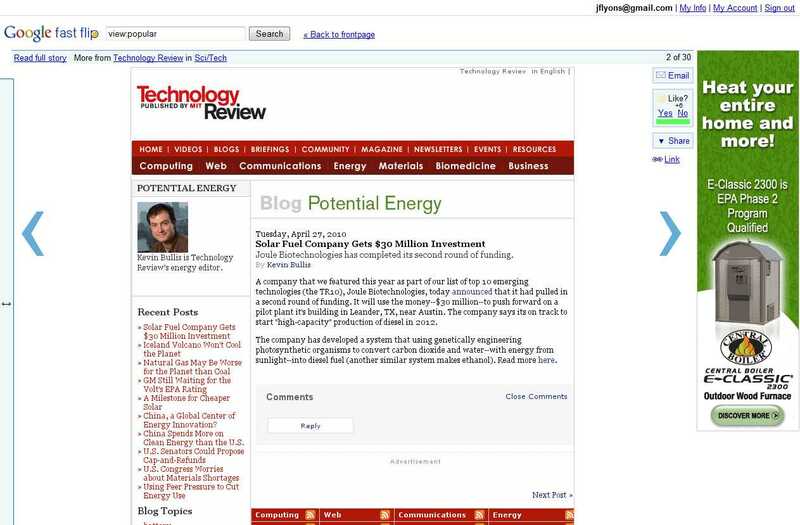 With April 2010 now in the books and remembered in tech circles as the month of the iPad, it is nice to see a “small humble company” like Google staying out of the news and quietly innovating, in this case with online publications and its Fast Flip program.